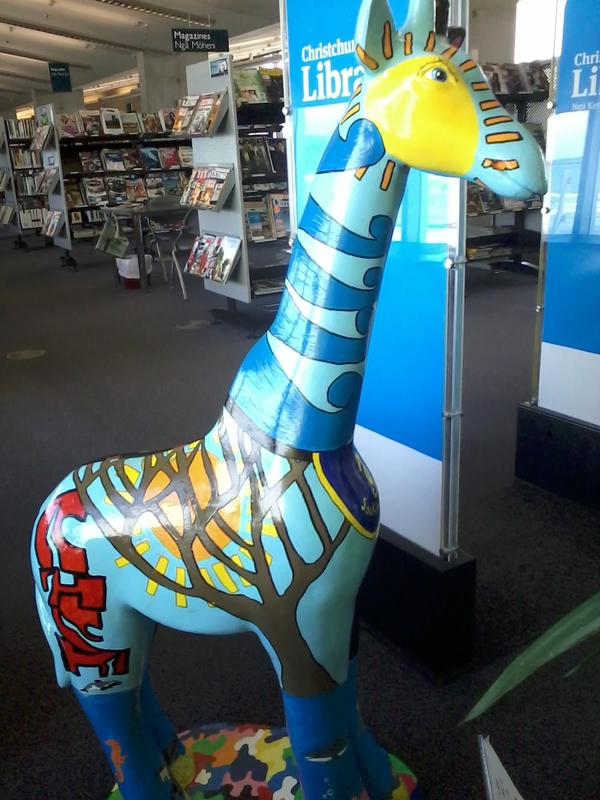 We will be honest and admit right here and now that when the Homestead first heard whisper of 99 fibreglass giraffes being painted up and dotted around the city as part of a summer sculpture trail we were not that convinced. Firstly, we were puzzled as to why giraffes were chosen; it’s not like they’re a normal part of life in our little place on the globe. Having said that, there is a very healthy, happy, entertaining family of them residing at our very own Orana Wildlife Park and we are always keen to hear of their happy events and saddened when bad times visit them. Their existence alone seemed a rather weak reason to choose the giraffe as a focus-point of a New Zealand sculpture trail though. “I mean”, we chuntered to each other, “What’s wrong with fibreglass kiwis or tuis or…we don’t know…opossums?” Then we took a breath and did a bit of research. Brought to our fair city by Wild In Art, the UK group responsible for large fibreglass forms of all description, from dragons to gorillas to London buses, being decorated and placed around a great many cities throughout the world, this a public arts exhibition is called Christchurch Stands Tall. 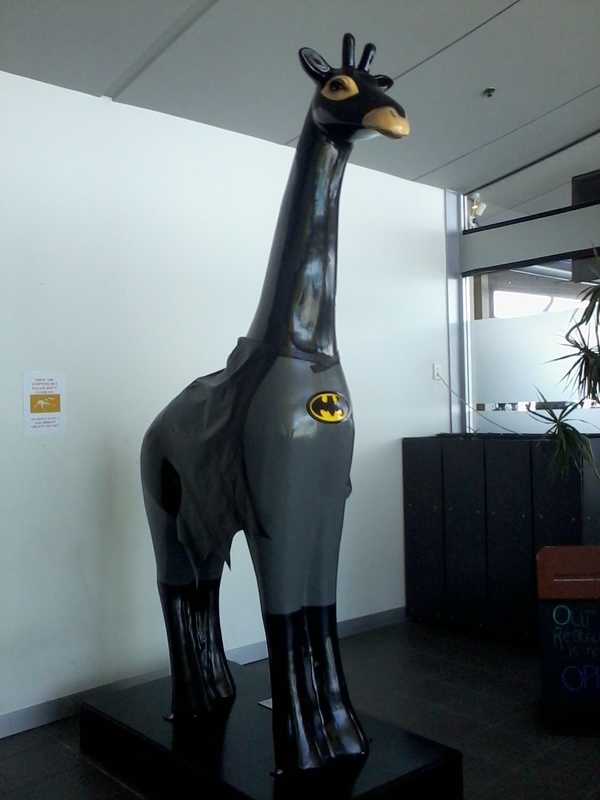 Bat Giraffe by Troy Gutry protecting New Brighton from evil doers from the perfect vantage point : the library foyer at the end of The Pier. Holy Topview! “Okay, giraffes convey that image nicely,” we begrudgingly admitted. Christchurch Stands Tall reflects the spirit of our city; we read, one of resilience, strength, beauty, talent, character and a great sense of humour. It was at this point that we did that awkward shuffle from foot to foot, sighed a bit, and then decided to pretend we had been behind this awesome event from its very conception. They didn’t even need to tell us that our city was the very first one (they called us one of the most intriguing cities in the world – go get us!) 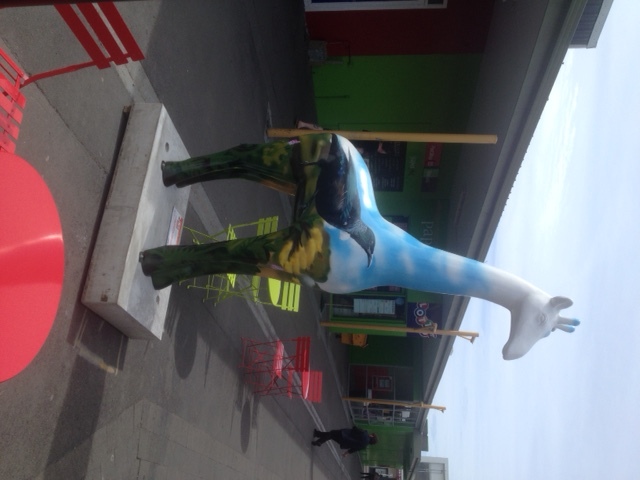 in New Zealand to be chosen for the Wild In Art treatment. It works like this: a number of schools (49 or 50 depending on which website you’re on – and we’ll overlook the fact that one of those schools was an interloper from Auckland; trust them to get in on our action!) 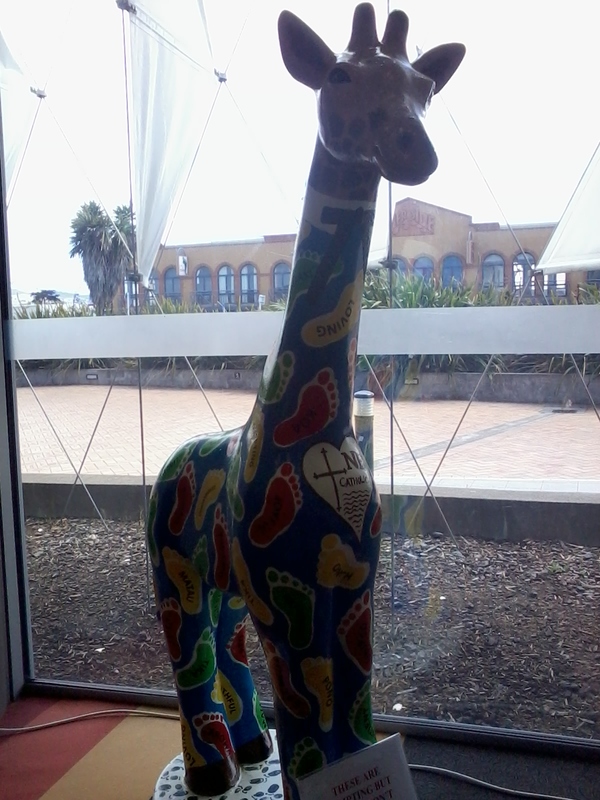 were each given a 1.3 metre giraffe and some donated paint and told to go for it. Meanwhile, local artists (both known and unknown) were asked to submit their ideas for giraffe decoration and the 49 “best” designs were chosen to decorate 2.5 metre forms. Head in the clouds…feet on the ground…everywhere in between…and beyond! by Pop Arts is hanging out by Switch Espresso like all the cool folk. Very pretty and we love the Tui! Now work on this group of giraffes (technically a tower) is completed and are Standing Tall all over Christchurch, including five (two big and three little) right here in New Brighton. At the suggestion of a blog friend we combined the weekly Homestead shopping expedition with a touch of wildlife spotting. The exhibition finishes at the end of January after which the large sculptures, including our very own Bat Giraffe and Head in the Clouds… , will be auctioned and 75% of the funds raised will be split between four wonderful charities: Child Cancer Foundation, Life Education Trust, Life in Vacant Spaces and Gap Filler. As for the babies, these will be returned to the schools that decorated them. 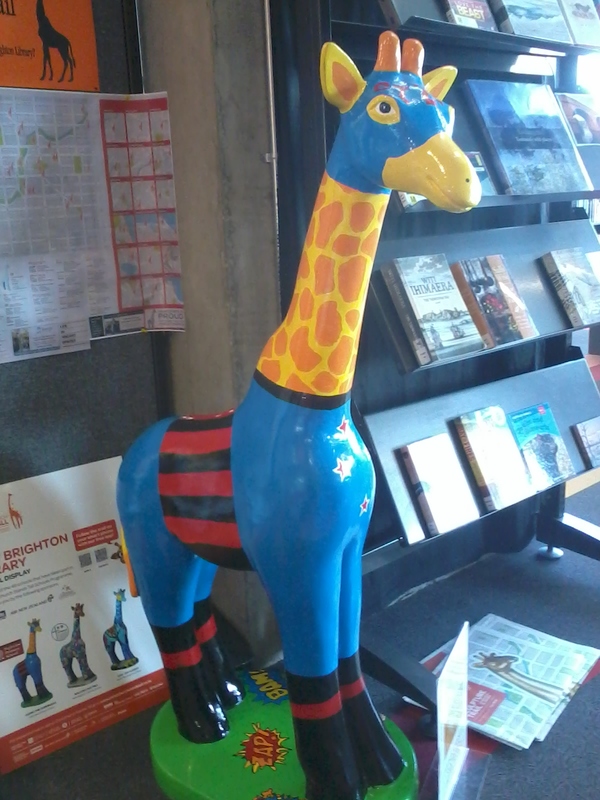 A popular decision as far as the cluster of school children/artists we discovered identifying their input into one giraffe’s design but we couldn’t help a grinch-like thought surfacing: what would a school do with a 1.3 metre decorated giraffe? But enough of this cynicism. Whatever it is, we hope it is big,bold and beautiful and makes as many people smile as these guys are at the moment. This entry was posted in community, Union Homestead and tagged Aotearoa, Bat Giraffe, Batman, Christchurch, Christchurch Earthquake, Christchurch rebuild, Christchurch Stands Tall, Christchurch Stands tall sculpture trail, Gap Filler, giraffe, giraffe sculture, giraffes, Kiwi, Life in Vacant Spaces, NaBloPoMo, New Brighton, New Brighton Catholic, New Brighton Catholic School, New Brighton Library, New Zealand, NZ, Otautahi, Parkview Primary school, Pops Art, rebuild, sculpture, South New Brighton School, Wild in Art. Bookmark the permalink. We have quite a connection with Orca – in his younger days from age 4 to 12 (when we left Rotorua) The Farmer played for a soccer team of that name. They enjoyed huge success so our we all have a very soft spot for the mighty orca. Yes, we have Lions Clubs here too but not Easter Seals (as far as I know). Did you see that Bristol UK had Gromit in 2013? Apparently having a whole bunch of Gromits around the city boosted tourism and “shone a light” on Bristol as a “hub for culture”…While this family enjoys Wallace and Gromit as much as anybody, I have to admit that Gromit as an icon of culture makes me giggle a bit. Thank you for showing us these giraffes, my favourite was Day and Night. Wild in Art helped put up Book Benches here in London, I published a blog about them on August 19th. They seem to be a splendid organisation. I enjoyed how different each one of them ended up despite all beginning with the same “canvas”. I like these kind of projects and ‘Christchurch stand tall’, is a nice metaphor, i’d say. Here in Cincinnati we have artful pigs everywhere hence the nickname Porkopolis..(meat industrie used to be big here;0)) I love them, they show up unexpectedly in all kind of shapes and forms. The Young Misters Walker enjoy artful moose true out the city of Toronto…even a Chinese one in Chinatown. Art for everyone with a little tongue in cheek..I love it! Have a great weekend! 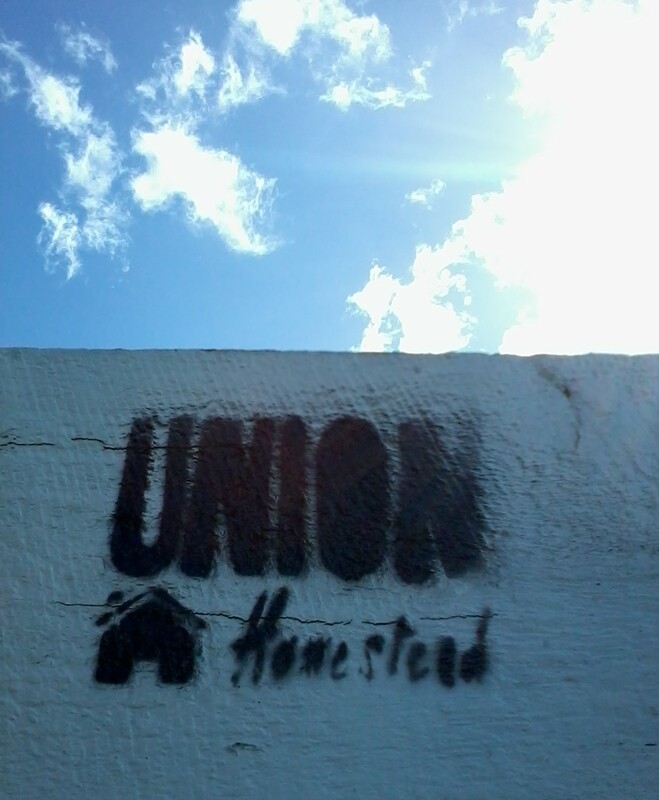 I am for this sort of thing in the general grounds that it brightens up a day and anything that does that is a plus.